For the last 11 years Dianne has made a huge impact on the Autism Society of Central Texas, connecting hundreds of other parents in the autism community to the information, experts, and support that they need. Most parents of children with developmental disabilities will tell you the same – it can be extremely difficult to find the right resources. Conflicting information can make those parents feel alone and confused as they try to find the best way to help their child. Over the last decade plus, Dianne Doggett has helped solve that problem for hundreds of Central Texas parents of children with developmental disabilities by connecting them with the latest information, with leading experts, and with each other. Autism spectrum disorders (ASD), including Asperger syndrome and others, are developmental disabilities that happen when the brain develops differently and has trouble with an important job – making sense of the world. 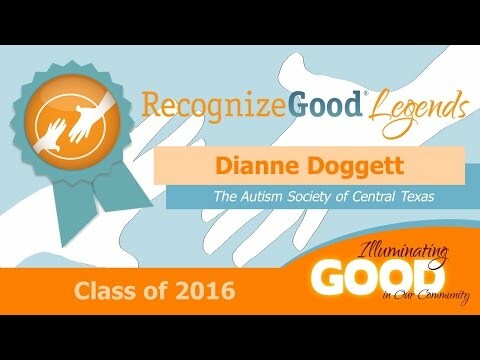 Dianne, parent to a teenage son with autism, has coordinated a monthly Autism Treatment Forum through the Autism Society of Central Texas (ASCT) since 2005, faithfully bringing expert speakers to talk about a wide range of autism-related topics to help Central Texas parents stay connected. The meetings are free and open to the public, held at the Old Quarry Library off Far West Boulevard. Perhaps more than anything, autism spectrum disorders are simply hard for others to understand or relate to since many symptoms of autism are completely outside others’ experience. With no cure currently in existence, family members can lean on this informational support group to keep them connected to new or creative interventions as well as frequent emails about local autism events and resources. Along with coordinating the meetings and informational emails, Dianne also presents her own expert perspective on topics like restful sleep and nutritional treatments. 65% of parents in the autism community report that a Gluten-free, Casein-free diet has helped their child’s autistic symptoms, and Dianne’s son has been on the GFCF diet for 15 years. In addition to her longtime commitment to the popular monthly forum program, Dianne has also served on the board of directors at Autism Society Central Texas and supported the organization’s fundraisers and other activities in many, many ways.